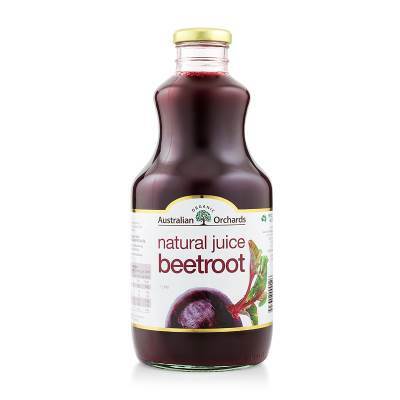 Douglas Park Organics Premium Beetroot Juice is a naturally made juice with 100% Australian content. Using majority beetroot and some apple to temper the flavour for a delightful juice. The texture is a smooth juice, to ensure a fresh, lively and natural tasting juice with a soft hint of apple cider vinegar to also balance the mouth fill. Most enjoyed and most beneficial when taken regularly or included as a base to super smoothies. The secret to this juice is all in the balance of the finest fruits and vegetable, and then gently filling into glass. Glass is still the best package medium to hold all the nutrients and goodness of the juice until you are ready to drink. Douglas Park Organics is a family business committed to sustainable agriculture and a healthy body. We believe that growing and producing foods in the ‘Organic and natural’ way provides foods in harmony with nature, and ourselves. No artificial chemicals, including no pesticides or fertilisers are used in the cultivation of our organic foods, as we believe these chemicals adversely affect the body, damage the land and build up in our environment.